Developing a business plan begins at the drawing board, and with a checklist. A business plan checklist template will help you iron out the fundamentals of your goals so that you can execute the plan with fewer issues both in the beginning states as well as later stages. A checklist can also potentially save you a great deal of money, especially as you near the later stages of the product. Best of all, the business plan checklist template is quick, efficient, and can be shared easily with colleagues. 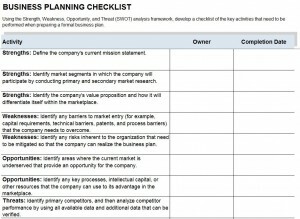 The business plan checklist template is completely free and available on this page for everyone. To begin, look for the large green download button on the upper right side of this page. Press the download button and select the save option when your browser download dialogue box appears. After the download has finished, either open it through your web browser, which can be reached by typing ctrl+j, or navigate to where it was saved on your hard drive and double click. To open the business plan checklist template you will need either Microsoft Excel or a comparable program that can display spreadsheets. If you do not own a version of Microsoft Office there are a few open source programs that you can use that are completely free. Once the template is open, you can fully customize it to your needs. The template is easy to use, so you will not have much trouble shaping it to your personal, or company’s, requirements. Once the business plan checklist template is open, you can select individual cells, or boxes within the spreadsheet, and enter data in them as you see fit. For instance, you will want to enter your company’s name, include additional threats, enter completion dates, provide owner’s names or more depending on the requirements and scope of the business plan. The font type and size can also be edited for a thematic or more personalized feel. To edit, select the data in the cell you want to edit and adjust the information as you see fit. It’s that simple!